In the event your gas furnace unit fails to work, homeowners should call our experts at JM Heating & Cooling to request an emergency service call. But before contacting a technician to set out and meet you, you can use these tips to troubleshoot your unit. Relighting a gas furnace isn’t terribly difficult to do, but not many people know how. To turn a gas furnace unit on, first find the unit’s breaker. It’s part of your home’s general electrical panel. You can turn this breaker switch to the ‘ON’ position and then locate and turn on the furnace unit switch. Now, some say this tends to be near the base of a home’s basement staircase, but can also be in the same room as the furnace unit itself. Once this is done, turn your thermostat switch to ‘heat’ and adjust your temperature from there. If these steps are done correctly, your home’s heating center should be back up and running in no time. Most times, the cause of a furnace unit outage simply comes from a pilot light blowing out. That’s the constant flame that sits waiting to ignite gas and begin heating the air that flows through the unit. If you need to change your furnace filter, begin by opening your unit’s panel door or rack. The furnace filter should easily slide out. If it’s dark or discolored, it’s most likely time to replace the filter. Again, do this inspection monthly and change it twice per year. When you install a new air filter, make sure it’s properly installed in the direction of the airflow through your home. Then, you should be set for another three to six months. Finally, when testing airflow in certain rooms, there’s a tried and true test that many homeowners use to pinpoint an airflow problem in their homes to explain underheated or undercooled spaces. It’s called the garbage bag airflow test, and it involves placing the mouth of a garbage bag over a heating vent and counting the time it takes for air to fill up the bag. In short, if it takes the bag more than ten seconds to fill up, airflow is weak in that area and your ducts should be inspected by a technician like ours at JM Heating & Cooling. 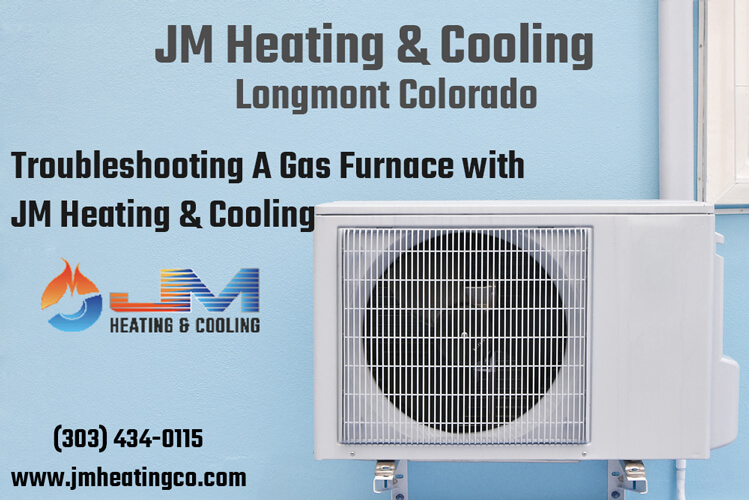 For all your other home furnace needs this heating season, contact our staff at JM Heating & Cooling for furnace repair Longmont Colorado, with your questions, comments, and concerns about your HVAC system.